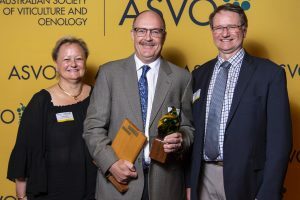 The Australian Society of Viticulture and Oenology (ASVO) last week announced its Awards for Excellence winners for 2018. Two researchers from CSIRO Agriculture and Food here at Waite were among the award recipients. The inaugural Dr Peter May Award for most cited paper from the AJGWR over the last five years was awarded to Dr Rob Bramley, CSIRO Agriculture & Food. The award was introduced for the first time this year to honour the late Dr Peter May who was the foundational editor of the Australian Journal of Grape and Wine Research. 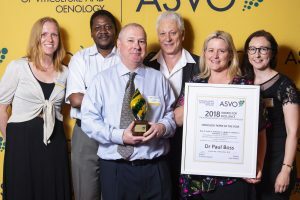 The winemaking paper of the year was awarded to Dr Paul Boss for ‘Fermentation of grapes throughout development identifies stages critical to the development of wine volatile composition’.